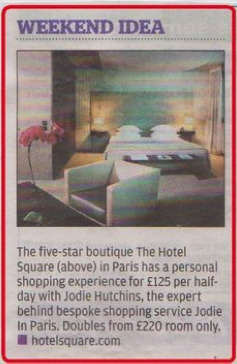 Jodie in Paris is in Citizen Mag! Read the latest on what’s new with Jodie In Paris! IN THE EVENING STANDARD! Check it out! for a unique Parisian shopping experience. Paris is, indeed, the most visited city in the world, which can make it somewhat difficult to find truly exceptional Parisian experiences in this beautiful city. To make the task a lot easier (and more memorable), the Hotel Square reached out to Jodie in Paris to create a new, singular shopping/sightseeing experience. Whether it’s vintage clothes, a truly Parisian restaurant for lunch, or the most romantic view in Paris, Jodie Hutchins knows where it is and when is the best time to go! The Hotel Square’s collaboration with Paris’ finest personal shopper means all aspects of Paris life are combined in one stay including a classic, traditional tour of Paris’ hidden gems and a contemporary, modern stay in one of Paris’ leading design hotel. The Hotel Square, a 5-star hotel which sits in the 16th neighbourhood of Paris was designed by leading French architect, Roger Taillibert, who is famous for designing Parc des Princes in Paris. YEAHBABY MAGAZINE: spotting the shopaholic tips! Jodie is treating you to some nice tips on where to find the best shopping bargains in Paris! And she knows what she is talking about! And Lucille Howe, editor of yeahbaby and writer, agrees! Now it's your call! Yeahbaby magazine is an award winning, bi-monthly inflight magazine for Bmibaby airline, which flies to more than 30 destinations and has been named the “UK’s best no-frills airline". Yeahbaby magazine has reached more than four million affluent readers throughout the last few years. It is packed with high-quality lifestyle features that appeals to the airline’s broad and diverse audience. The magazine provides a unique, quirky, and insightful information for passengers. Topical features cover local cultures, personalities, shopping, and resorts. "Paris Je t'aime!" PARIS LUXE MAGAZINE review! Editor-in-chief Rita Borges has launched her latest luxury magazine, Paris Luxe, in November 2011. The magazine will concentrate on the luxury market in Paris and is largely distributed in select airport lounges. Paris Luxe is the premier luxury vacation rental agency in Paris. Paris Luxe is also the World's #1 Paris Luxury Experience Curator. And thanks to their attention to detail, Paris Luxe has been featured on the Travel Channel. They have also received noteworthy press from Robb Report, Travel & Leisure, BTE (Business Travel Executive), Elle Decor, and Australian Vogue. Read a transcript of Paris Luxe's article on Jodie Hutchins where she shares her thoughts on the best places to be, to go, and to shop in Paris! As it says, she will be your personal shopper extraordinaire! How long have you lived in Paris? Believe it or not, it was 14 years last June 23rd. I have no idea where the time went. I came for one month’s vacation for my best friend’s wedding and just ended up staying. One year turned to two, then seven and now 14! How did you get started as a personal shopping assistant? Again by accident! I had been working for a small company designing luxury handbags and faux fur throws. While at this job, I was my boss’s EVERYTHING: personal assistant, assistant designer, public relations; I even decorated her house for parties and Christmas, did all of her personal shopping and then some. I even did her hair. I was always running all over Paris for her. At that time I had lots of friends coming to visit me in Paris, and they would ask me what was the coolest hotel to stay at, what were the best places to eat, and, bien sur, where to shop. Then one day a very dear friend, Bill, said to me while we were out shopping, “Jodie, you know what? You should become a personal shopping guide!” It was a great idea, a light clicked on and there you have it. I take them all over the city for different types of shopping. And if they are not big shoppers, I show them around town to see the sights, including things off the beaten path that they would not find on their own. I show them how the metro works and so on; I’m basically their friend in Paris. Every day is different as I cater to the needs and wants of my clients. The people that come reflect different ages, different budgets and different lifestyles, so I find just the right Paris for them. Are there are special times of year that people should visit Paris for shopping deals? Oh, yes. As we are only allowed two sales a year, the summer one starts the end of June and the winter one the end of January, and they each last just one month. You’d better be ready to push or get pushed and get your hair pulled. How far in advance to guests have to book with you? Well, it depends on the time of year. At the start of last May, I was booked for all of June. The longer in advance the better, but I would say about one month as a rule. Sometimes I can squeeze a client in with only one or two weeks of advance notice. What was the best shopping deal that you were able to get a guest? A vintage Hermès Kelly bag. We sweet talked the price down and down and batted our eyelashes until we closed the deal; we got 300 or 400 euros off the asking price. I think the salesman lost money on that sale, but my client was on cloud nine! Jodie is an American in Paris who has spent more than a decade exploring the City of Light. From the back-street boutiques to beautiful spas, she has a long list of recommendations and is fluent in both English and French, making navigating the city a breeze. Jodie has worked in fashion, make-up and designed handbags as well as home accessories. Extensive experience as a personal assistant, coupled with her fashion savvy, makes Jodie an ideal personal shopping guide. Unlike most shopping services that always keep to a set route, Jodie creates personalized itineraries that keep you in mind.